On 12th May 2006 the House of Lords debated a Private Members’ Bill from Lord Joffe: the ‘Assisted Dying for the Terminally Ill Bill’. 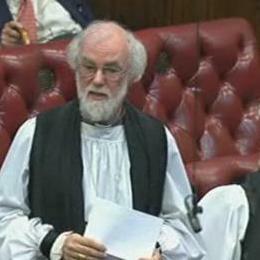 The then Archbishop of Canterbury, Dr Rowan Williams, was one of three Lords Spiritual who spoke against, in a debate that lasted over seven hours and featured 90 speakers. The Bill would have allowed a doctor to prescribe medication upon request from a terminally ill patient with capacity, so that by means of self-administration, that patient could end his or her life. Following the debate a vote took place on whether to allow the Bill to proceed any further. Peers voted to not allow it to proceed by 148 to 100. 14 Lords Spiritual joined those voting against the Bill. The Archbishop of Canterbury: My Lords, opposition to the principle of this Bill i s not confined to people of religious conviction—as we have been reminded by the noble, monotheistic and utilitarian Lord, Lord Carlile—and it would be a lazy counter-argument to suggest that such opposition can be written off because it comes only from those committed to a world view not universally shared. It is worth remembering that the secular or “enlightened” view of human autonomy assumed by many of the Bill’s defenders is no less a particular world view rather than a self-evident and universal truth. It is, of course, the case that the opposition of many of us is rooted in religious conviction—a conviction not about an abstract principle of the sanctity of life but a conviction, rather, about the possibilities of life. All religious believers hold that there is no stage of human life, and no level of human experience, that is intrinsically incapable of being lived through in some kind of trust and hope. They would say that to suggest otherwise is to limit the possibility of faithful and hopeful lives to those who are in charge of their circumstances or who enjoy a measure of control and success. Believers hold that even experiences of pain and helplessness can be passed through in a way that is meaningful and that communicates dignity and assurance. Of course this is not universally held in our society but, if it is true, we should expect that to ignore it would bring disastrous risks. Whether or not your Lordships agree with the fundamental principle from which those of us on these Benches—and, indeed, elsewhere—begin, it is not too difficult to spell out the nature of these risks and perhaps to find agreement there—as, indeed, we have found agreement in the powerful statements from the Royal College of Physicians and, even more, in the extraordinarily detailed submission of the Royal College of Psychiatrists in recent days. Many others will want to elaborate on these risks and, as time is limited, I shall confine myself to what I think are the most evident. The first is this: whether or not you believe that God enters into consideration, it remains true that to specify, even in the fairly broad terms of the Bill, conditions under which it would be both reasonable and legal to end your life, is to say that certain kinds of human life are not worth living. As soon as this is publicly granted, we put at risk the security of all who experience such conditions. That this is not an abstract matter or a matter concocted for scaremongering purposes by sinister Prelates ought to be evident from what has been said by the Disability Rights Commission and, indeed, by the association of sufferers from motor neurone disease. Secondly, we jeopardise the security of the vulnerable in another way by radically changing the relationship between patient and physician. The physician is not obliged to raise the possibility of assisted dying with the patient according to the Bill, yet every patient will know that this is a statutory possibility and there are many ways of exerting pressure on people even without intent. Furthermore, if a patient wishing for assistance in dying is confronted with a physician who has conscientious scruples, provision is made that he or she will be entitled to look around for an alternative. But how are we to guarantee that any such alternate could possibly give the advice and informed support that can be provided only by a doctor who has been involved long term with a sufferer? Does not the possibility of an alternate actually deprive even the patient who wishes to end their life of the best in medical care? Thirdly, we cannot conduct this debate in the abstract. In spite of the assurances helpfully given by the noble Lord, Lord Joffe, and the noble Baroness, Lady Jay, we know all too well that our health service is under severe financial pressure. We know, too, that while the standard of palliative care in the United Kingdom is second to none, it is distributed with great unevenness. What incentive is there to broaden and improve that standard if there is a simpler and, I have to say, more cost-effective solution to these pressures? I recognise fully that this is far from the authentically compassionate intentions of the Bill’s proposers, but in our present circumstances, can we say with confidence that this is a climate in which we can secure the kind of debate and consideration that is needed? The evidence from Oregon is, at best, ambiguous; that from the Netherlands, as we have been reminded, offers no comfort at all. Finally, having mentioned palliative care, I shall touch upon one more related matter. It is professionally acknowledged that the number of situations in which physical discomfort or agony is consistently and unavoidably extreme is very small, given our steady advances in pain control. Often what supporters of a change in the law are really arguing about is the mental and spiritual agony of the terminally sick. Those of us who have spent long hours with such people, witnessing and absorbing such agonies, would be the last to dismiss the seriousness of this. Yet to legislate on the basis of states of mind is again to open a door into a general change of attitude about the legitimacy of ending one’s life, which has implications for everyone—for the suicidal teenager as well as the dying 80 year-old. We return to my opening point: what will we be heard to be saying about the worthwhileness of life under certain conditions? Do we, by legally accommodating the mental suffering of some, debase the currency for all? These are not trivial considerations; nor are they parochially religious ones. I believe that they are pertinent for anyone who wishes to see our society remain committed to human dignity and liberty and to the finest possible medical care for all our citizens.